Start wildlife safari tour of rajasthan from delhi after visiting incredible delhi heritage attractions visit wildlife reserves of rajasthan to see wild animals and migrated birds. Both jeep and canter safaris are available at national park. How can we forget to visit the Taj mahal ? An incredible attractions for world travellors to India. Company representatives will receive you on arrival at the international airport in Delhi late in the night or midnight. Transfer to your hotel. Relax from long journey. Overnight stay will be at Delhi. Transfer to the Nizammudin railway station for train to SAWAI MADHOPUR after breakfast. Reach at railway station where guide will await you and transfer to the already booked resort. Evening free at the resort and you can relax or watch some slides on the tiger safari. Overnight at resort. 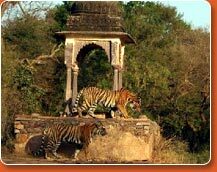 A full day game viewing inside the jungle during that you will enjoy two safari - jeep / canter to spot tiger & some other wild species in rantham,bore wildlife reserve. Overnight at the resort. Early morning RICKSHAW RIDE at the Bharatpur Bird Park to see some migrated bird & take some photgraph in bird sanctuary. Proceed to visit & see beauty of wonder of world Agra Taj mahal during sun rise. Enjoy battery van ride to the Taj Mahal. Later go to hotel for breakfast. Visit Itmadullah's Tomb built by Empress NOOR JEHAN in memory of her father. After lunch drive to Delhi & directly transfer to international airport delhi to catch flight for onward destinations / Home with sweet memeories of wildlife tours to rajasthan.